Microsurgeons often have to deal with vessel shortness in flap surgery and in direct anastomosis of vessels after trauma or resection. Inadequate length of vascular pedicle may obligate to change the option from pedicled to free flap. In addition, when a free flap is planned, if there are no available recipient vessels in proximity of the defect, there will be a need for an additional action to overcome this vascular gap. This problem is conventionally solved by vein grafting., Other efforts to obtain a pedicle of adequate length are reconnection of vascular pedicle to other vessels, and exploring an alternative pedicle for a certain flap. Based on the capacity of regeneration of tissues under mechanical forces, we designed a study suggesting that isolated vessels can be elongated under traction vectors and provide an additional vessel length, maintaining their patency. We applied daily gradual traction to rat femoral artery and vein, perpendicular to their course by the distractor body of an internal maxillofacial distraction osteogenesis system (Synthes, Inc., DePuy Synthes, Johnson & Johnson, Paramount Drive, Raynham, MA, USA). At the end of the traction period, vessel length, patency, and histologic findings were evaluated. The study was approved by the Animal Care and Use Ethical Committee. Thirty adult Wistar-Albino rats weighing an average of 300 g were used. They were kept in solitary cages and were fed with standard rat chow and tap water. Anesthesia was provided by 50 mg/kg ketamine and 15 mg/kg xylazine was given for analgesia and sedation. Under general anesthesia, the left femoral and flank regions were shaved. Femoral incision was done parallel to femoral vessels. Inguinal ligament was found and 20 mm of the vessel length was released distal to this point [Figure 1]. The femoral nerve was excised along this distance and the vessel branches (superficial epigastric artery and vein) were ligated and separated. Start and end points were marked with 10/0 nylon sutures placed on the adventitia. Blood flow was assured by milking test in both artery and vein. The vessels were wrapped in a 5 mm of soft silicone piece [Figure 2]. Subcutaneous dissection was done to place the traction device on the line that will pull the midpoint of the vessels at a 90° angle. An incision was done on the left flank region and a pocket was prepared for device placement. The device was fixed to the underlying muscle tissue in two points to prevent axis deviation of the traction vector. Activation end was left outside the skin for daily turn [Figure 3]. Mobile end of the device was connected to the vessels through the silicone piece with 5-0 nylon suture. 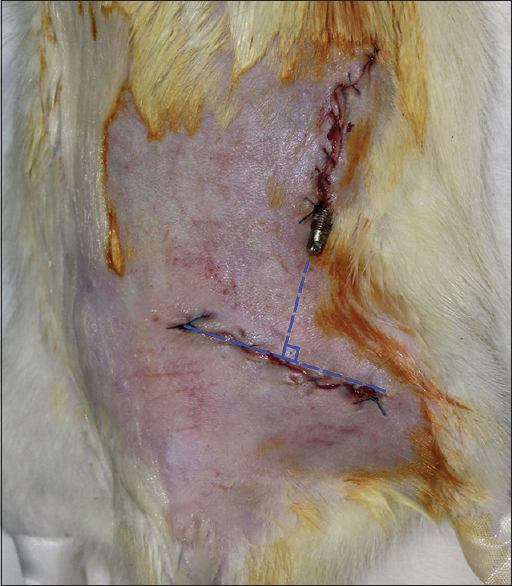 Incision was closed with running sutures. The traction was activated the next day of procedure. 1 mm traction per day (twice a day 0.5 mm with 12 h periods) was applied for 10 days and, on the 11th day, the animals were taken to operation for evaluation. The fibrotic tissues were cleaned and vessels were exposed. Patency was assessed by milking test. Artery and vein were then excised together from the start and end points that were marked before. They were put on moist gauze with no tension applied and length was measured. Then, the piece was kept in formalin solution for histologic evaluation. One of the animals in this group was selected randomly for angiographic imaging. Vessel preparation was done similar to the experimental group. Traction device was not placed and traction was not applied. On the 11th day, the animals were re-operated, and patency and length were assessed in the same way and vessels were biopsied for histologic analysis. One of the animals in this group was selected randomly for angiography. The vessel samples were preserved in formalin solution and paraffin blocks were prepared. 5-μm cross sections were taken with microtome and the sections were stained with hematoxylin and eosin. All data were entered in PASW 18 (SPSS, IBM Corp., Armonk, NY, USA). Mann–Whitney test and Fisher's exact test were applied for data analysis. One animal from each group was selected randomly. Under general anesthesia, the traction device was removed and the patency of femoral vessels was evaluated by milking test like the rest of the group. Later, 5 cc of lead oxide solution was given into the left ventricle of the heart. After sacrification, detailed angiographic images were taken under digital mammography device (Selenia Dimensions, Hologic, Inc, MA, USA). Then, the vessels were biopsied. When the femoral region was reopened, there was significant fibrosis in the traction group, both in vascular bed and vessel periphery, sticking the artery and vein together [Figure 4], right]. Major fibrotic tissues were cleansed; the artery and vein were separated again and prepared for milking test and sampling. In the control group, fibrosis was less and the vessels were found adhered to their beds, with a shiny biofilm covering them [Figure 4], left]. The artery and vein were prepared for milking test and sampling. 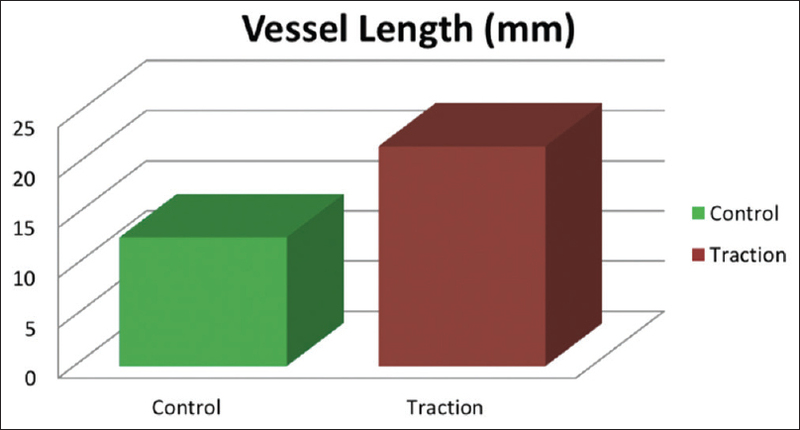 Mean length of vessels in the control group was 12.86 mm (11–15 mm, standard deviation [SD] = 1.30) and 21.93 mm (19–25 mm, SD = 1.70) in the traction group [Figure 5] and [Figure 6]. When evaluated with the Mann–Whitney test, the length of vessels in the traction group was found significantly higher than that of the control group (P = 0.000). In the control group, all arteries and veins were patent when assessed by milking test (n = 15). In the traction group, there were thromboses in 20% (n = 3) of the arteries with accompanying veins. There was no isolated arterial or venous thrombosis [Figure 7]. When evaluated with Fisher's exact test, there was no statistical significance found between patency rates of traction and control groups (P = 0.224). In the traction group, the increase in vessel length was not correlated to increased thrombosis rates (P = 0.769). In the microangiographic imaging, course of the left femoral artery was opaque, showing that there was blood flow in both control and traction groups [Figure 8]. Because the animals were not alive and were kept in cold conditions, they were stiff and legs could not be extended optimally. Microangiography did not yield information about the vessel length. 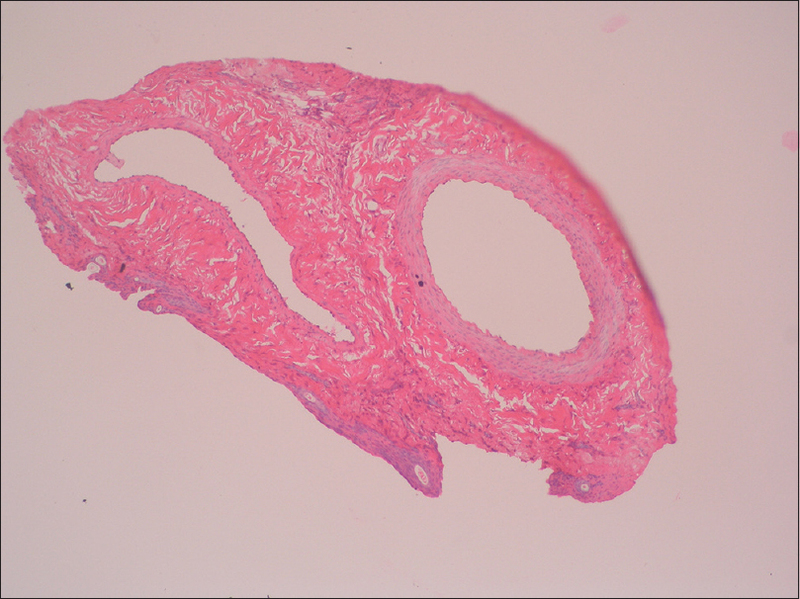 The histologic sections of the control group showed no luminal obstruction in the artery or vein. 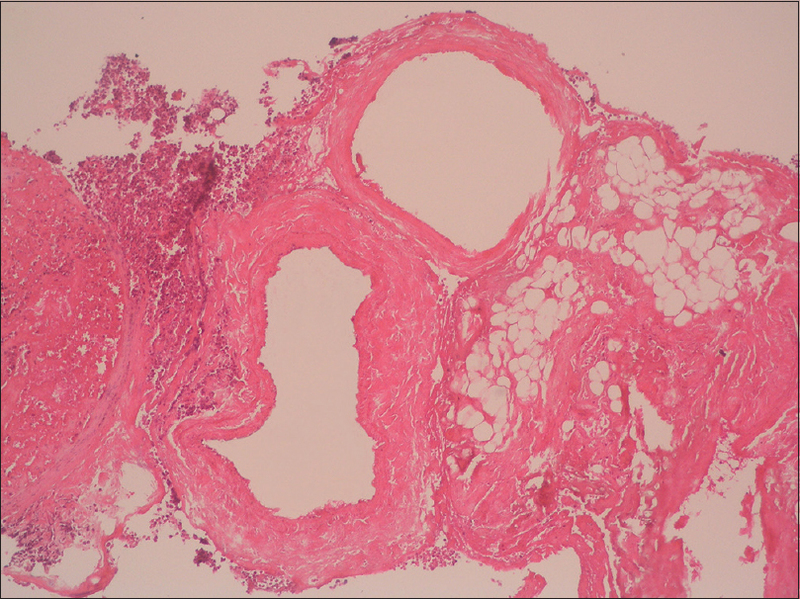 There was no fibrous thickening in the perivascular zone [Figure 9]. In the traction group, arterial wall was observed thicker compared to that of the control group. There was neutrophil infiltration in periarterial zone and adipocytes were seen close to adventitia. There was no thrombotic focus in the artery in blood flow patent samples (n = 12) [Figure 10]. In the nonpatent samples (n = 3), there was erythrocyte and other blood element aggregation, causing thrombosis [Figure 11]. In the vein structure, it was seen that vessel caliper was enlarged and the wall was thickened compared to that of the control group. Like artery, there was no thrombosis in the lumen in patent veins (n = 12) and thrombotic foci were seen in nonpatent samples (n = 3). In 1987, Stark et al. 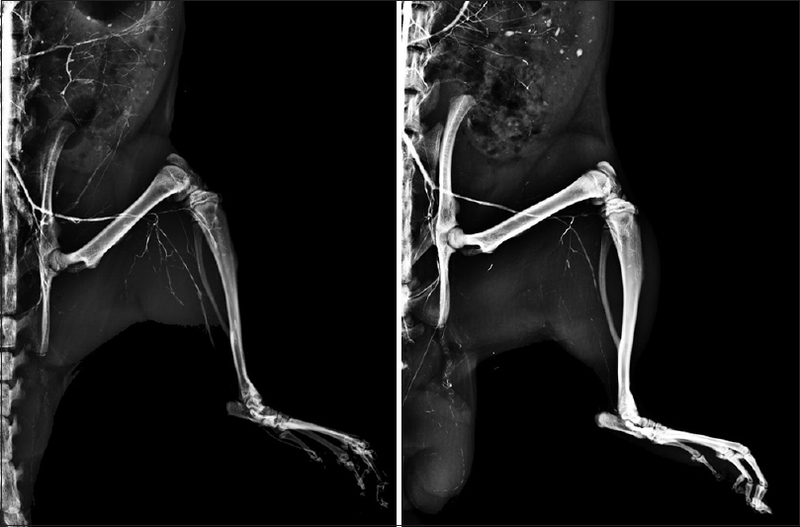 reported the successful elongation of isolated rat femoral vessels by tissue expansion. In their study, the expander was placed on the underlying musculature and the force was distributed to the entire surface of vessels with an outwardly radiating fashion. The thrombosis rate was increased with higher expansion rates. In our study, traction was applied to the 5-mm segment on the midline of femoral vessels by distraction device via the silicone piece and this segment was responsible for carriage in the direction perpendicular to the course. The length of this segment and the feature of the wrapping material may be a determiner of patency. Speed of traction was same for the entire experiment group, so no deduction could be made about the effect of traction speed to the patency of blood flow. The postexperimental mean length of the control group was 12.86 mm which shows the elastic contraction of the femoral vessels, which were 20 mm in situ, after adventitial dissection, delay period of fibrosis, and separation from the premarked points. The postexperimental mean length of the experiment group was 21.93 mm which accounts for a 70% length compared to the control group and shows the success of the elongation process due to traction, opposing to the primary contraction and fibrosis factors. From the mathematical perspective, the final length of the vessels is the sum of the two hypotenuses of two triangles [Figure 12]. Horizontal border is formed by the femoral vessels before the traction, vertical border is the traction length, and hypotenuse is the half of the final length of the vessels, where theoretically, we assume is √ 20, that is, about 14 mm, leading to a 28 mm of total vessel length (length of silicon piece is neglected). 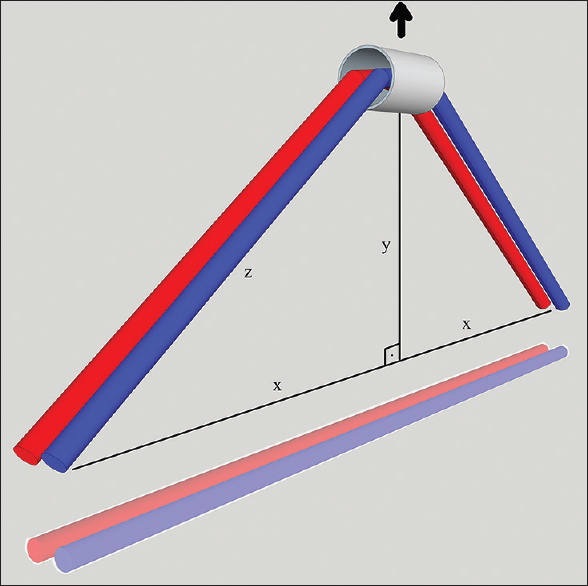 In our study, the mean vessel length after traction is found to be 21.93 mm, that is, 78% of theoretical expectation. Elastic features of vessels and fibrosis formation during the traction period result in a lesser amount of vasculogenesis than theoretically expected. The gained vessel length is not only a result of the elastic properties of the vessels, but also a gradual regeneration process with endothelial, intimal, and perivascular proliferation, as in the skin expansion process, biological creep plays role on the generation of new vascular tissue. 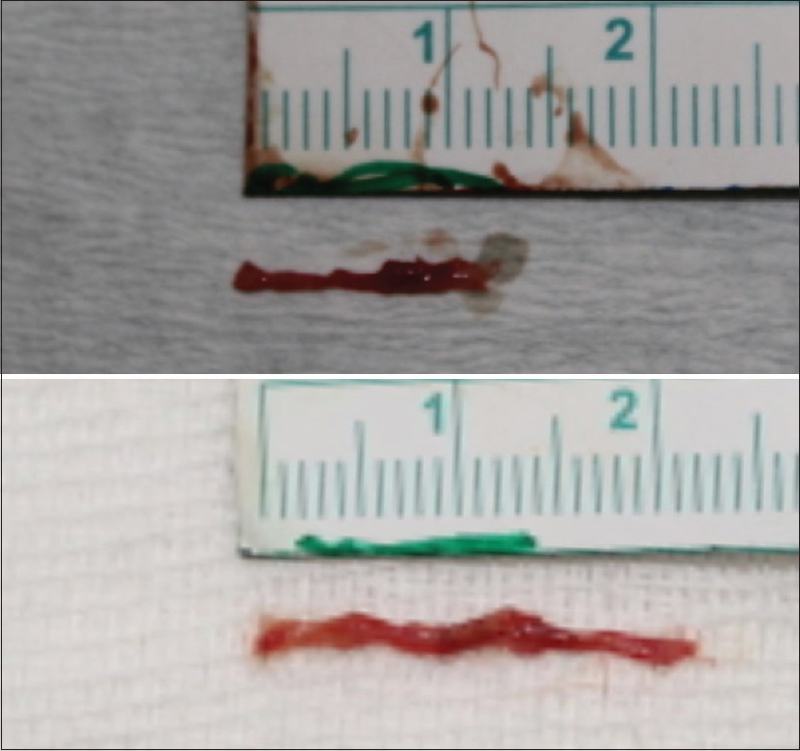 Unlike the acute arterial elongation technique, which is intraoperatively performed to gain an instant vessel length by stretch capacity, traction vasculogenesis allows time for adventitial, muscular, and intimal cell regeneration additionally. 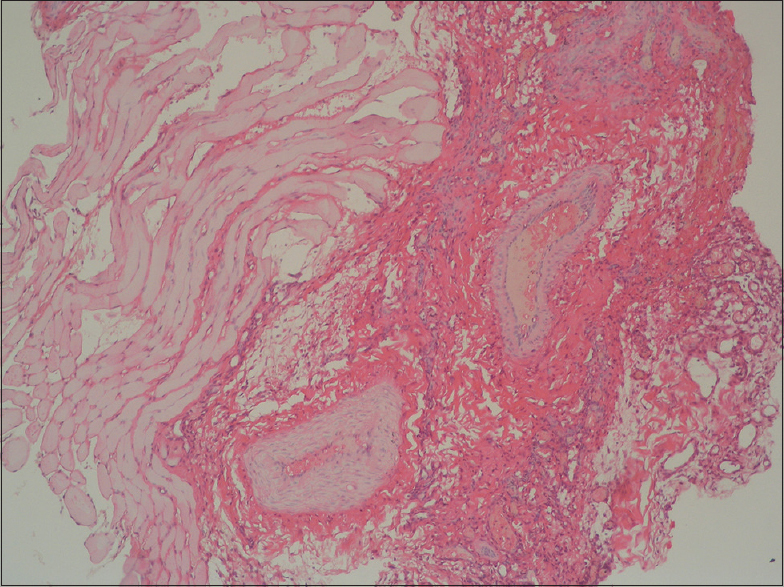 Histologically, endothelial decomposition may occur in acute elongation, where it does not affect blood flow patency. In traction vasculogenesis, no disruption in endothelial integrity was seen. To overcome vascular shortness, vein grafting is the conventional and most commonly adopted technique with a high success rate.,, In nonemergent cases, vessel elongation may be used as a substitution for vein grafting in future. As a preliminary study, this study shows the reaction of arteries and veins to tractional pattern of force. Elongation can occur with a low rate of thrombosis. Further research needs to be done for this novel technique to be applied to clinical practice. With suitable size applicator devices, defined optimal traction rates, surface areas, and patency monitorization during the traction period, and automated mechanisms, this procedure may provide a significant help in reconstructive microsurgery. Our results of this novel technique are encouraging for future studies and trials in axial and perforator flap models. The regenerative capacity of vessels with vectoral mechanical forces is inspiring to investigate the functional elongation of other longitudinal structures such as peripheral nerves. Nelson JA, Fischer JP, Grover R, Kovach SJ, Low DW, Kanchwala SK, et al. Vein grafting your way out of trouble: Examining the utility and efficacy of vein grafts in microsurgery. J Plast Reconstr Aesthet Surg 2015;68:830-6. 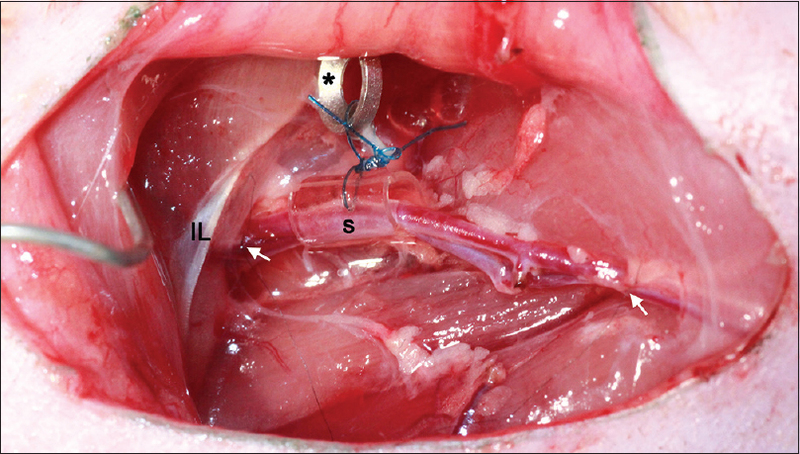 Ozturk C, Uygur S, Ozturk CN, Lukaszuk M, Siemionow M. Feasibility of using external jugular vein and its branches as Y- and X-shaped vein grafts for bridging of arterial defects and providing additional arterial sources for free flap applications in rat model. J Reconstr Microsurg 2014;30:371-4. Huang YH, Hsieh TY, Lai CS, Lin SD, Chang KP. In situ pedicle lengthening of the anterolateral thigh flap. Plast Reconstr Surg 2014;133:85e-7e. Park BY, Seo SW, Mun GH. 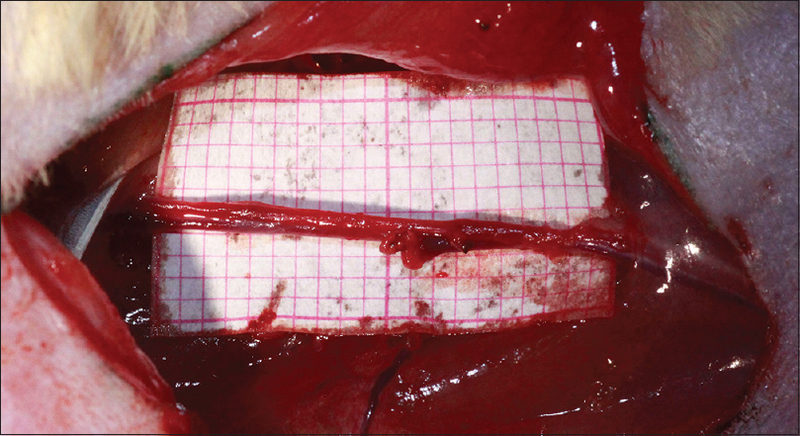 Microsurgical pedicle lengthening for pedicled thoracodorsal artery perforator flap transfer. Ann Plast Surg 2014;73:174-6. Yoshimatsu H, Yamamoto T, Iida T. Pedicle elongation technique of superficial circumflex iliac artery perforator flap. J Plast Reconstr Aesthet Surg 2015;68:e61-2. Johnson TM, Lowe L, Brown MD, Sullivan MJ, Nelson BR. Histology and physiology of tissue expansion. J Dermatol Surg Oncol 1993;19:1074-8. Gencel E, Eser C, Tabakan I, Kesiktas E, Yavuz M. Outcomes of tissue expander application for scalp reconstruction in extensive aplasia cutis congenita. Aesthetic Plast Surg 2016;40:114-9. Kempton SJ, McCarthy JE, Afifi AM. A systematic review of distraction osteogenesis in hand surgery: What are the benefits, complication rates, and duration of treatment? Plast Reconstr Surg 2014;133:1120-30. McCarthy JG, Stelnicki EJ, Mehrara BJ, Longaker MT. Distraction osteogenesis of the craniofacial skeleton. Plast Reconstr Surg 2001;107:1812-27. Stark GB, Hong C, Futrell JW. Rapid elongation of arteries and veins in rats with a tissue expander. Plast Reconstr Surg 1987;80:570-81. Wilhelmi BJ, Blackwell SJ, Mancoll JS, Phillips LG. Creep vs. stretch: A review of the viscoelastic properties of skin. Ann Plast Surg 1998;41:215-9. Cohen BE, Ruiz-Razura A. Acute intraoperative arterial lengthening for closure of large vascular gaps. Plast Reconstr Surg 1992;90:463-8. Ruiz-Razura A, Williams JL Jr., Reilly CL, Cohen BE, Schini VB, Vanhoutte PM, et al. Acute intraoperative arterial elongation: Histologic, morphologic, and vascular reactivity studies. J Reconstr Microsurg 1994;10:367-73. Zhang F, Oliva A, Kao SD, Newlin L, Buncke HJ. Microvascular vein-graft patency in the rat model. J Reconstr Microsurg 1994;10:223-7. Zhang F, Oliva A, Kao SD, Newlin L, Buncke HJ. Microvascular vein grafts in the rat cutaneous free-flap model. J Reconstr Microsurg 1994;10:229-33. Bayramiçli M, Tetik C, Sönmez A, Gürünlüoǧlu R, Baltaci F. Reliability of primary vein grafts in lower extremity free tissue transfers. Ann Plast Surg 2002;48:21-9.